Valor Janitorial is the NUMBER ONE choice for professional janitorial services and office cleaning services in Dallas, Texas. We specialize in janitorial services for medium to large office buildings and we offer our services at an unbeatable price. Our Dallas, Texas service area includes all major business parks and industrial districts in the DFW metroplex. We provide the most advanced and state-of-the-art commercial cleaning services in North Texas. Our cleaning technicians use the latest cleaning techniques along with state of the art equipment and are trained as needed to use the newest environmentally safe cleaning techniques. We offer free on-site estimates and now for a limited time are offering a special promotion with new janitorial service contracts. 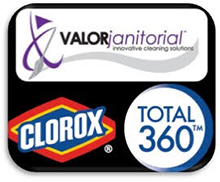 Get up to 1000 square feet of carpet cleaned when you sign up for new Janitorial Services with Valor Janitorial. This special offer is valid on new janitorial services contracts that total $1500 or more per month.